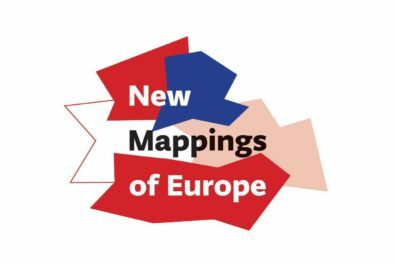 Within the manifestation Greek Days in Belgrade, from April 20 to 29, 2018, a mini-exhibition Ancient Greece will be organized at the Museum of Yugoslavia. 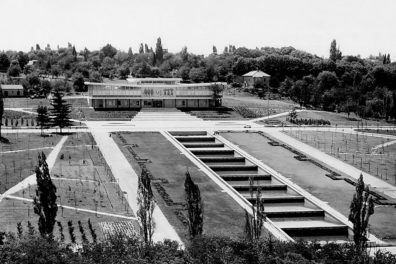 The exhibition will include objects from the archeological collection of the Museum of Yugoslavia, originating from Greece or given as gifts to Josip Broz Tito by the Greek statesmen and diplomats. These are: a helmet (bronze), 7th-6th century B.C. ; a female figure, terracotta, 4th century B.C. 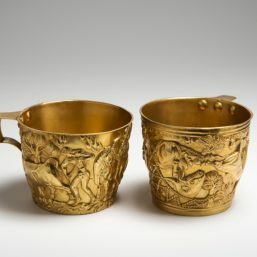 ; replica cups, gold, 15th century B.C. ; vases – painted ceramics, 6th-5th century B.C. ; a statue of Eros and Psyche, 2nd century B.C. The authors of the exhibition are Katarina Živanović, curator, and Momo Cvijović, museum advisor. In Athens, on June 2, 1954, at lunch that the Greek King Paul and the Queen Federica organized in honor of Josip Broz Tito, the bronze helmet was presented as the main gift. 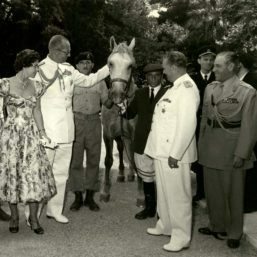 In return, Tito gave to the royal couple a pair of Lipizzan horses with full equipment. This helmet, of the so-called Corinthian type, was originally intended as a gift. Even though it was made in full warfare form, it could not serve its true purpose because of its small dimensions (20 cm high). It is therefore assumed that the helmet was made as a votive gift to one of the ancient sanctuaries. 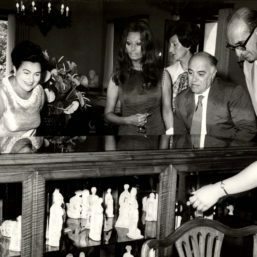 In 1954, Greek Prime Minister, Marshal Alexander Papagos, gave to Tito an ancient terracotta figurine titled Dancer of Tanagra. 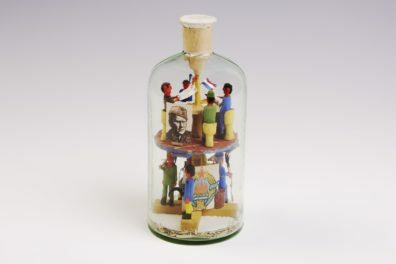 In return, Papagos received from Josip Broz a sculpture Boy with the Fish, the work of Antun Augustinčić. In ancient Greece, the making of terracotta figurines with molds reached its peak during the early Hellenism, when the so-called Tanagra style dominated, named after the statues found in the necropolises of the Boeotian city of Tanagra. The Greek king gave to Tito gold replicas of the famous cups from Vaphio in Laconia. To his guest, Tito gave a map with copies of frescoes from our monasteries, as well as a smoking set made in silver and gold, decorated with corals. 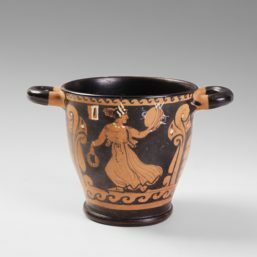 The authentic cups, attributed to Cretan artists, were discovered in 1889 and have been kept at the National Archaeological Museum in Athens. All five ancient vases were gifts from Greek statesmen and diplomats. On the Galeb ship, a vase of the pelike type was given to Tito by Konstantin Karamanlis, Greek Prime Minister in 1959. The lekythos with the scene of Athens fighting against the Giant and the one showing young men in the palaestra were also gifts from him. The kylix was a gift from the delegation of the members of the Greek parliament in 1952, while the skyphos was the gift to Tito for his 80th birthday from the Greek regent Papandopulos in 1972. Statuette Eros and Psyche is one of the 68 ancient terracottas that were given to Josip Broz by the Executive Committee of the League of Communists of Croatia on May 25, 1955. 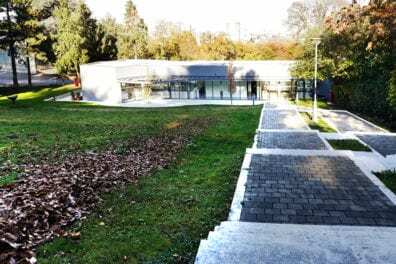 This collection of exceptional beauty, representative in both artistic and archaeological sense, was donated at the White Villa in Brijuni (Croatia).